The Structure Deck R is a series of Structure Decks which reworks some of the old structure decks and gives them new cards. What happens when we take 2 of the most recent structure decks and pit them against each other? We find out whether Technology or Tyrannos are better! Here’s a video where we pit the 2 structure decks against each other. The decks used are formed by using only cards from 3 copies of the structure deck and we focus on the key strategies provided by the deck. The deck lists are provided below.Enjoy the video! 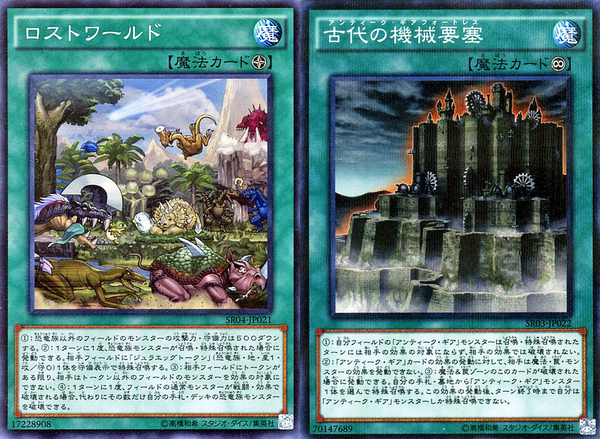 The Dinosaur deck focuses on making use of the normal monsters and token generating abilities of Lost World and Ojama Trio for the effects of Survival Line. Lost World reduces the attack and defence points of your opponent’s monsters which are not Dinosaur-Type and generates a token when you summon a Dinosaur-Type monster. That token can be utilised by Souleating Oviraptor to revive your Dinosaurs or by Survival Line to summon out Dinosaurs from your deck. The concept works well with Ojama Trio that provides disruption against your opponent while giving you 3 additional monsters from Survival Line, letting you easily build up a big field quickly. Combined with cards like Rescue Rabbit, Survival Line can help you to dish out lots of damage quickly. With Rescue Rabbit and Survival line helping you to summon out your Dinosaur-Type monsters quickly, that fills up your grave to make use of with Miscellaneousaurus and Ultimate Conductor Tyranno. Miscellaneousaurus helps you special summon out your Dinosaurs from your deck like Souleating Oviraptor to search through your deck or Babycerasaurus / Petiradon which summons out even more monsters if you already have a Souleating Oviraptor on the field, while Ultimate Conductor Tyranno is the deck’s boss monster that can shut down your opponent’s monsters by setting all of them face down. Both cards require you to banish Dinosaur-Type monsters from the grave, giving your Tyranno Infinity 4000 ATK or more easily. The Technology deck focuses on quick summoning of your monsters from your deck by utilising Geartown and Ancient Gear Catapult. Ancient Gear Catapult is the new spell card that works together with Geartown to summon out Ancient Gear monsters from your deck. To utilise it, a face up spell or trap card can be used, such as Ancient Gear Fortress or Fiendish Chain, both of which can generate more advantage by either summoning out another Ancient Gear monster from the Graveyard or by letting you use it to negate your opponent’s monster effects before hand. 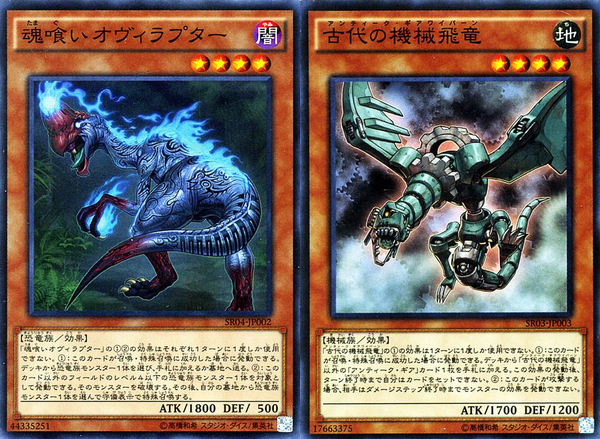 Monsters to summon by using these cards would be Ancient Gear Reactor Dragon and Ancient Gear Wyvern. Ancient Gear Wyvern provides you with searching capabilities, allowing you to search out more Ancient Gear cards such as Ancient Gear Fortress, while Ancient Gear Reactor Dragon can destroy spell / trap cards after it attacks, clearing out your opponent’s back row threats or destroying your Ancient Gear Fortress to special summon out even more Ancient Gear monsters. 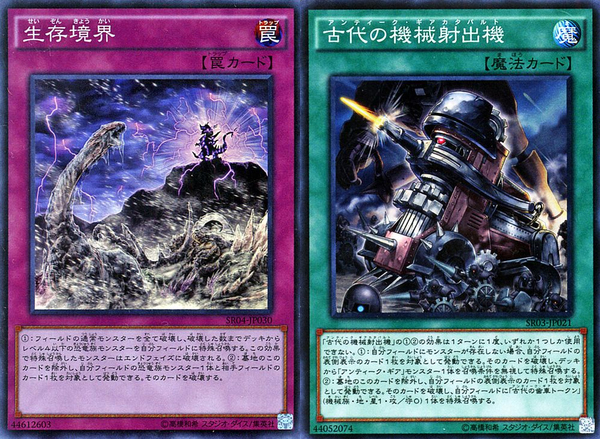 To complement with the strategy, cards like Card Trooper and Machine Duplication are utilised to summon out beaters, while helping to load your graveyard with Galaxy Cyclone, Ancient Gear Catapult or just monsters to revive with Call of the Haunted. Galaxy Cyclone and Ancient Gear Catapult have grave effects which can help you destroy your Ancient Gear Fortress or Geartowns to summon more monsters. Gigantes also helps with the strategy since it can special summon itself while destroying all spell / trap cards on the field when it is destroyed by battle. 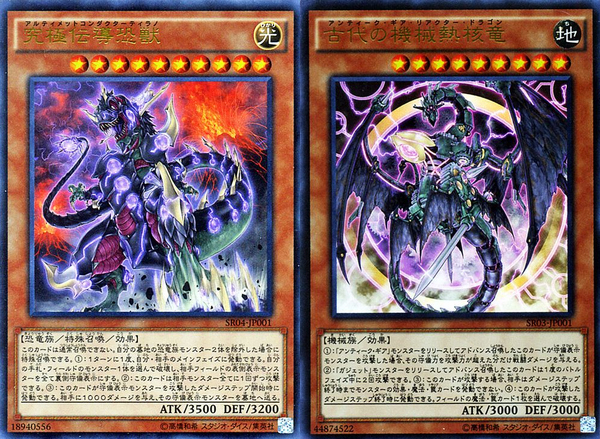 Both decks surprisingly have similar strategies, where they use cards to summon out monsters from their main deck. Both decks received new cards that let them search out their combo pieces, protective effects that protect their monsters and new boss monsters which allow them to beatdown their opponent quickly and efficiently. 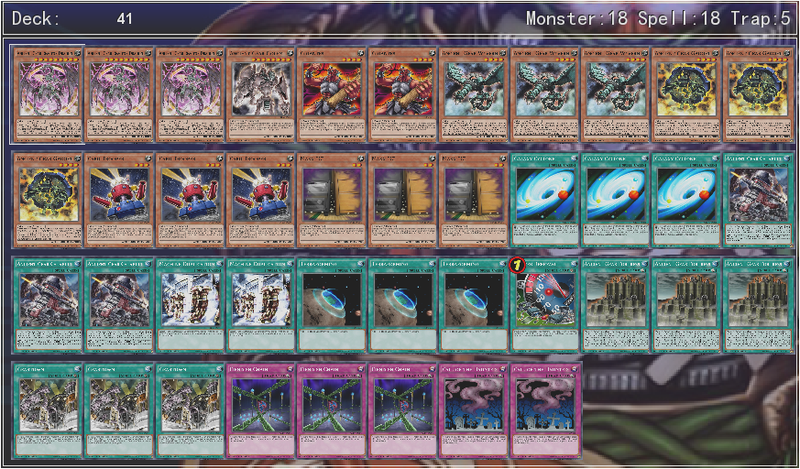 However after putting both decks against each other, it becomes clear that the Structure Deck R: Tyranno’s Rage gave a much bigger boost to the Dinosaurs, compared to the boost Ancient Gears received from the Structure Deck R: Machine Dragon Re-Volt. Here’s a direct comparison at some of the new monsters and spell / trap support that both decks received. Both decks received a monster that can search through their deck. In addition to their searching effects though, Souleating Oviraptor can special summon more Dinosaurs from your Graveyard while Ancient Gear Wyvern only prevents your opponent from activating monster effects. Comparing the 2 continuous / field spells, Lost World directly reduces your opponent’s monsters stats and helps you summon out tokens for the deck strategy and also protects your normal monsters while letting you special summon even more monsters from your deck by destroying one of the baby dinosaurs from the deck. Ancient Gear Fortress however only protects your monster from destruction for the turn they are summoned and can only revive a monster from the Graveyard when it is destroyed, requiring another card to destroy it. Survival Line combos well with the decks strategy of normal monsters and is highly flexible by how it allows you to use tokens to bring out possibly multiple monsters from your deck. Furthermore it provides disruption with a grave effect that can destroy one of your Dinosaur-Type monsters (Preferably one of the baby dinosaurs) to clear any opponent’s cards. In comparison, Ancient Gear Catapult only summons out 1 monster, with a highly restrictive requirement that you have no monsters on the field to activate it. Furthermore it’s grave effect is only useful if you have Geartown or Ancient Gear Fortress on the field, while only summoning a token which cannot be used for any of the deck’s strategy other then tribute fodder. Even when looking at the boss monsters for both decks, Ultimate Conductor Tyranno can be special summoned from hand and has a strong disruption ability to set all your opponent’s monsters face-down, all combined with bigger stats. Ancient Gear Reactor Dragon however is a monster that does not have any special summoning abilities on it’s own. Although it has a strong effect that destroys a back row card after attacking while also preventing your opponent’s from activating any effects while it’s attacking, it has no abilities during the opponent’s turn, meaning it is only a big monster that provides minimal threat. After comparing the cards that both decks received, it is painfully clear that the Structure Deck R: Tyranno’s Rage is the better deck of the 2. A month after the release of Tyranno’s Rage, Dinosaurs are seeing some small success in tournaments in the OCG either on it’s own or combined with other decks such as True Draco. However the Ancient Gears have gotten their new cards for over half a year and they have not been relevant to the meta throughout. 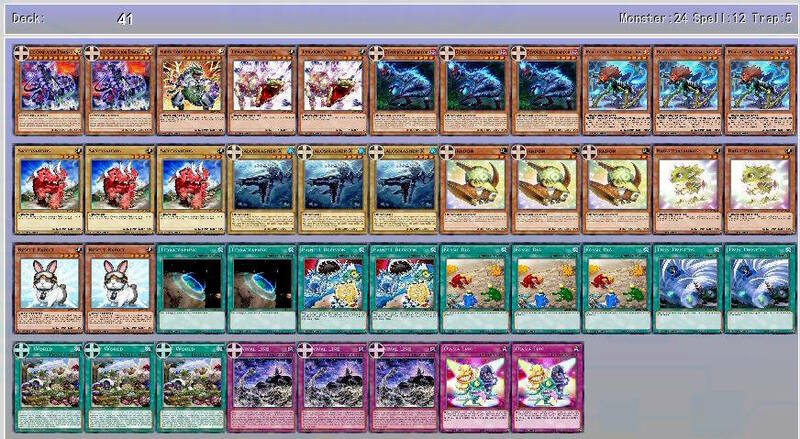 With a more consistent deck strategy and stronger cards over the Structure Deck R: Machine Dragon Re-Volt, Tyranno’s Rage is the better deck of the 2.